A lot of messaging and navigation apps have already added the ability to share your live location with others and Whatsapp has recently implemented this feature as well. Other apps such as Facebook Messenger and Google Maps also have it. The way it works is similar regardless which of these apps you’re using – you just need to select a conversation thread (group chats are also supported) and share your live location once you select for how long you want the feature to be enabled. 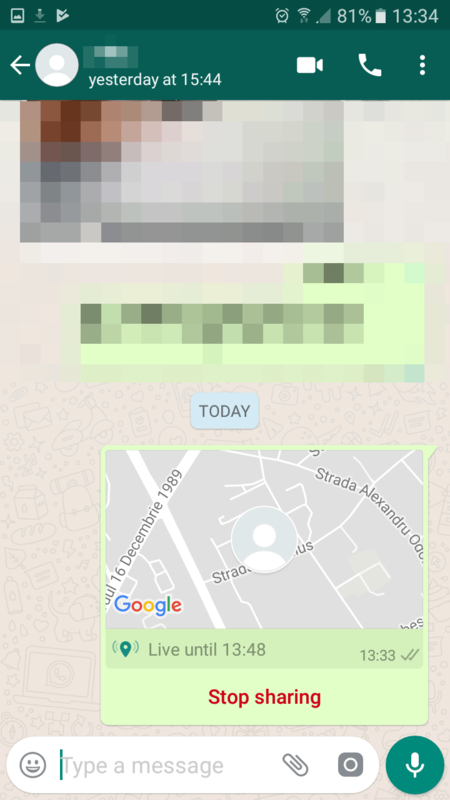 It’s quite easy to share your live location on Whatsapp and we’ll show you how to do it in a moment. However, keep in mind this feature is a recent one, so if you haven’t update the app in a while now would be a good time to do it. 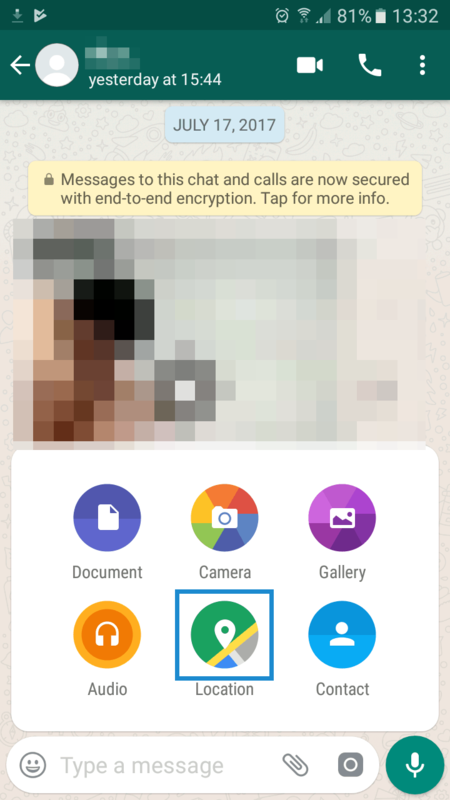 Launch Whatsapp and open a new or existing chat thread. Tap the attachment icon next to the text input field. Select Location in the menu that pops up. 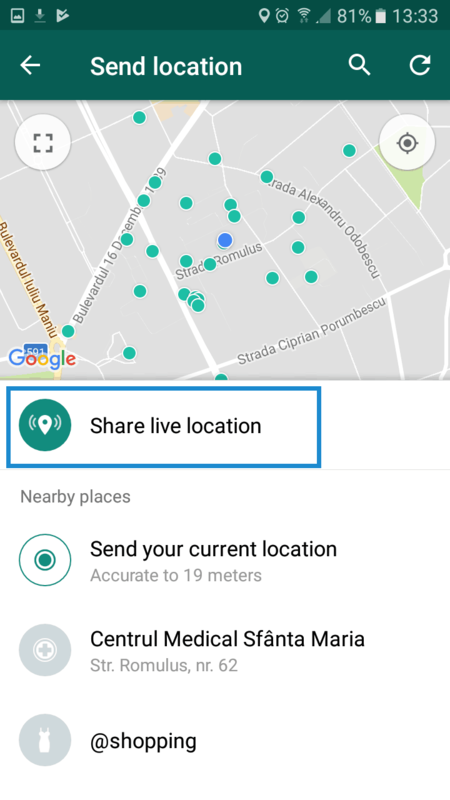 The new option called “Share live location” is also the first. The other options allow you to share your current location, as well as nearby places but they won’t be updated in real-time. 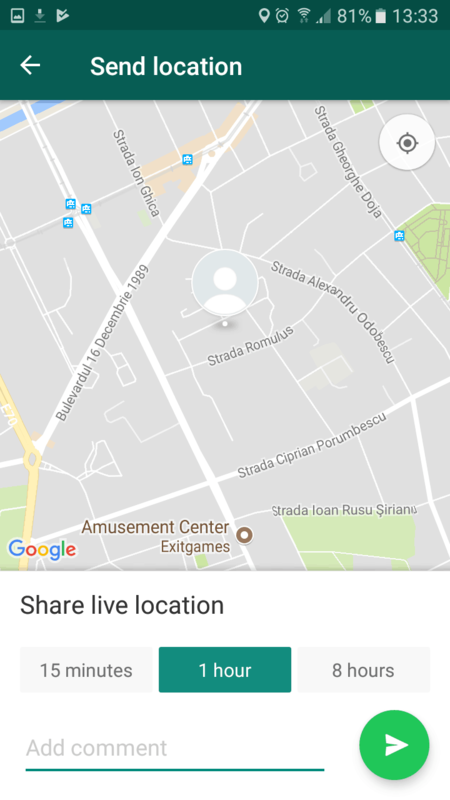 Tap on “Share live location” to continue. Note: Whatsapp might prompt you to update location permissions. If you don’t grant them, you won’t be able to use the live location feature. On the next screen, you can select for how long you want to share your live location. There are three preset options: 15 minutes, 1 hour, or 8 hours. Select whichever is suitable for you. Optionally, you can also add a comment. Tap on the green arrow icon to share your live location. This will send a mini-map in the current chat thread where the recipient will be able to see your whereabouts updated in real-time. It also provides a button called “stop sharing” so regardless for what time interval you shared your live location, you can just tap it to disable the feature at any moment. 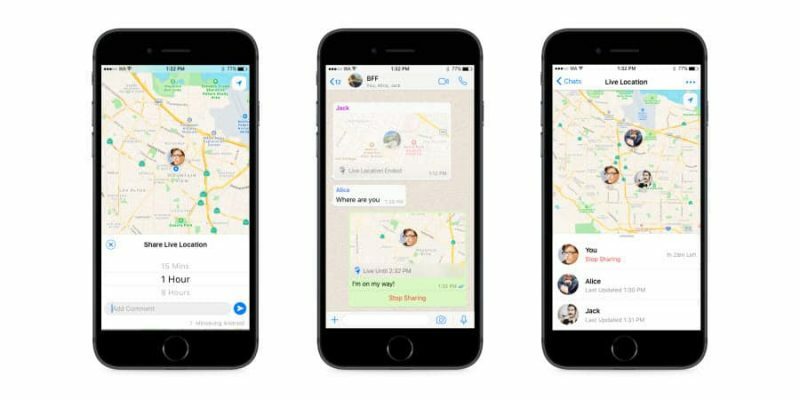 Since using this feature will make Whatsapp use your location, you might be worried about battery drain. It will be slightly higher than if you were not to use it, but nothing too terrible. Speaking of, if you use both Facebook Messenger and Whatsapp, I would recommend you use the latter for sharing your live location – Messenger is significantly more battery hungry compared to Whatsapp. Live location sharing is a simple way to let the person you’re about to meet know where you are. It’s also great when a friend is going to pick you up and you’re not very good at giving directions!